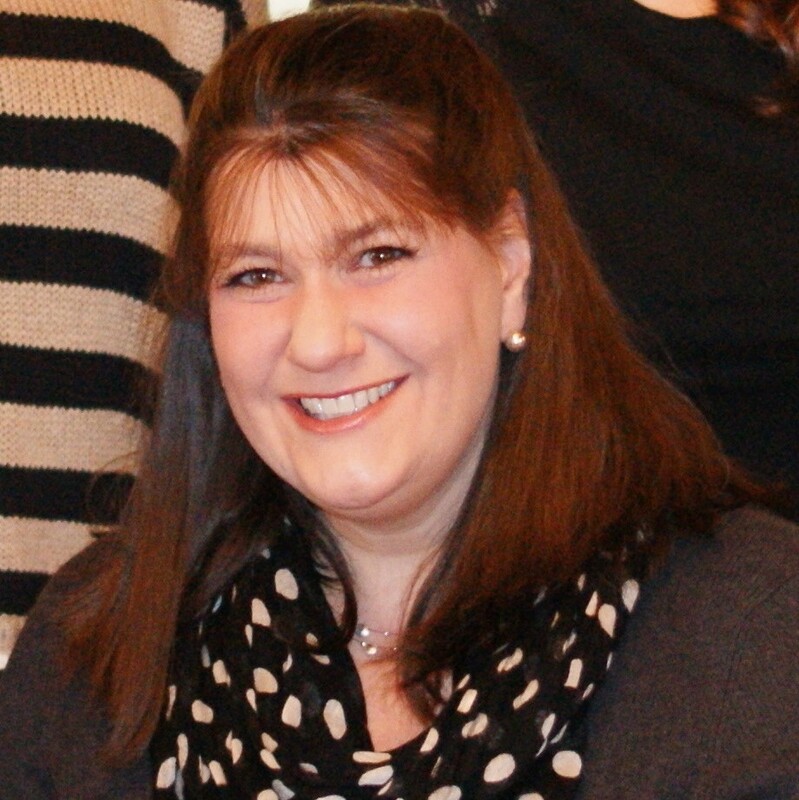 Blogger at The Kitchen is My Playground ~ we're having fun with home cooking, one recipe at a time. Looking for a dish with make-ahead convenience for Easter dinner, those potlucks, or the upcoming summer cookout season? 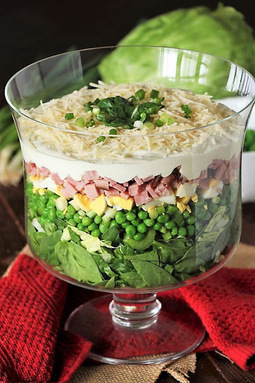 Look no further than this make-ahead Layered Spinach Salad that's perfect for serving a crowd. Not only does it taste great, it's right pretty too. This Carrot Cake Sheet Cake with Cream Cheese Frosting has always been Mom's go-to carrot cake recipe, and it's my go-to now, too. 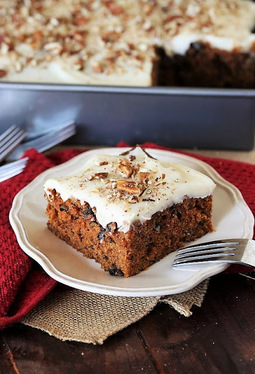 But there's a "secret" ingredient that gives this version of carrot cake fabulous flavor and wonderful moistness, all without shredding a single carrot. As great as a cream pie is from a restaurant, believe me - they're even better when you make them from scratch at home. 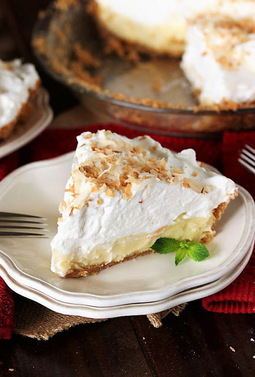 And in the case of this Coconut Cream Pie? Making it at home is more than worth the effort! This truly is the BEST Coconut Cream Pie recipe, with fabulous coconut flavor and melt in your mouth creaminess that is downright fantastic. Is Ambrosia a side dish or dessert? Does it really matter? 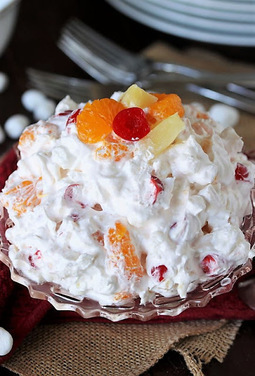 ... Because no matter how you choose to enjoy it, classic Ambrosia Salad is just plain good. With its creamy mix of mini marshmallows, whipped topping, coconut, and fruit it's just one of those dishes that's loved by all. Are you a lover of chocolate and cherries together? 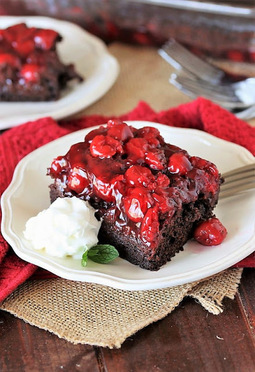 Give Mom's Chocolate Cherry Upside-Down Cake a try! With it's tasty rich flavor and how easy it is to make, I sure still love it today just as much as I did as a kid. If you're a lover of all things creamy, comforting, and delicious, this classic Chocolate Lush Dessert recipe is for you! With its beloved chocolate pudding and creamy delicious layers, what's not to love? It's just one of those classic crowd-pleasing desserts that seems to be adored by all. 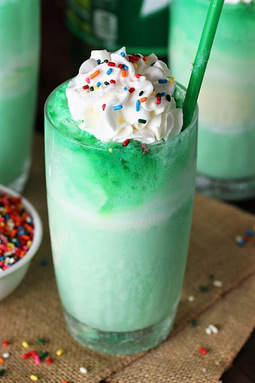 It may be hard to trap a leprechaun, but it's easy to whip up Leprechaun Shakes! Enjoy these tasty little shakes for an easy St. Patrick's Day treat. The amazing flavor combination of coconut and caramel in this no-machine needed ice cream is simply dripping with deliciousness! This may be the simplest little appetizer ever ... but it packs a big flavor bang for the buck! Irresistibly tasty and irresistibly adorable homemade Biscoff kisses. Whip up the yummy cuteness! Looking for quick and easy party food? Three-ingredient Crescent Sausage Bites are super simple and always a party hit! The classic flavors of turtle candy ... chocolate, pecans, and caramel ... in a soft and insanely delicious cookie. This is a classic! 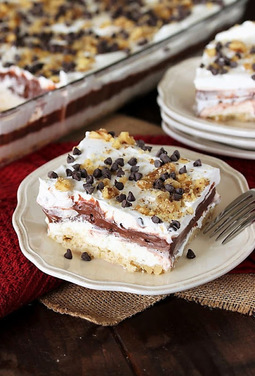 No-bake Chocolate Eclair Icebox Dessert is creamy, delicious, and comforting. And it's ALWAYS a big hit!! 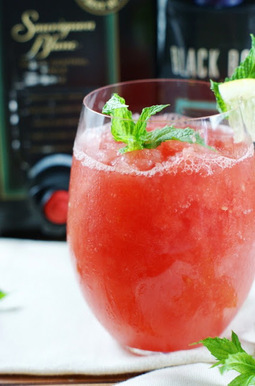 Watermelon-Moscato Slush ... grab a big ol' juicy watermelon and some semi-sweet white wine for whipping up this refreshing summer fun. 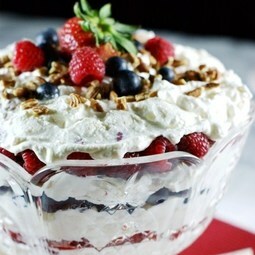 Delicious Triple Berry Punch Bowl Cake ~ all decked out in red, white, & blue.